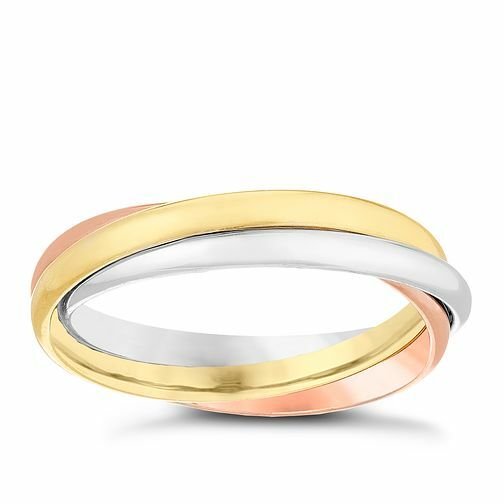 A classically elegant piece of jewellery, this eye-catching Russian wedding ring is beautifully crafted in contrasting 9ct gold, rose gold and white gold. 9ct Gold 3 Colour Russian Wedding Ring is rated 3.4 out of 5 by 5. Rated 1 out of 5 by Anonymous from Not the same quality as it was before I bought this ring as my Wedding Ring a few years ago and was so pleased with it. Unfortunately, recently, I lost the ring! Gutted! I was pleased to see HSamuel still manufactured it so I bought a new one. When it arrived I was so disappointed with the quality the second time round. The bands of the ring were hollow and they weren’t before, this made the ring look and feel cheap - similar to something out of a Christmas Cracker (sorry to be harsh but it really did remind me of this) I ended up returning it. Also, the images online did not show this change to the design. Perhaps the supplier changed...? Rated 1 out of 5 by Anonymous from Lovely Watch BUT... ... terrible catch! Catch juts out/protrudes and will catch on anything and everything. Is also not strong/tight enough and falls open easily. Looking at pictures of the same watch online, you can see that the catch is not in line with the wrist band. Shame as the watch is lovely!